After the requisite Thanksgiving feasting was over and the hubster and I could not fathom any sort of activity that required serious use of mind or body, we headed upstairs to watch a movie. Something light, I thought. Yes, that would be good. After a search of our Netflix queue (I love streaming video! 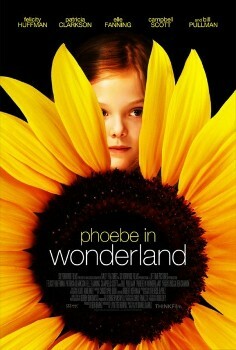 ), we found what looked to be the perfect choice: Phoebe in Wonderland. The description says it is about a girl who starts to see the characters from Alice in Wonderland after she takes a role in the play. Silliness and fun! Let’s do it! Though there is some silliness and fun, the film is hardly that, but in a good way. Phoebe, superbly played by Elle Fanning, is a beautiful and slightly peculiar young girl, frustrated by sameness and rules that make no sense. She lives with her parents, Peter (Bill Pullman) and Hillary (Felicity Huffman), and a rather precocious younger sister, Olivia (Bailee Madison). On the outside, they have what seems to be the perfect life: happy and successful writers that live in a gorgeous home with two whip smart and lovely daughters. Truth be told, Phoebe’s behavior is troubling, more and more so (obsessive hand washing, hopping, and uncontrollable spitting, among others). Olivia wishes her sister weren’t such a weirdo while being a bit of an angry radical leftist herself. Karl Marx as a Halloween costume, anyone? Hillary is struggling to keep up with the increasingly difficult duty of being a mother to two such precocious children, is jealous of her husband’s success, and can’t seem to find a moment to write herself. While Peter, happy for his own modest achievements, can’t disguise his hopelessness at his inability to help anyone in the family. Things take a turn for the better and worse when Phoebe meets the lovely and equally eccentric Miss Dodger (Patricia Clarkson), tries out for the school play, Alice in Wonderland, and finds sanctuary, however small, whenever she jumps down the rabbit hole, so to speak. It is a beautifully filmed story, filled with gorgeous locations, saturated colors and rich, complex characters. At it’s heart, it is an earnest film about life. It is scary, confusing, and unpredictable, and filled with rules, questions, cruelty and unreasonable expectations. It is also filled with love, acceptance, imagination, infinite kindness, and honesty. The best way to survive it is to embrace it (and yourself), just how it is, without shame, and forge headlong into the unknown. Jump! Happy Tuesday, gentle readers. How are you? I am chilly-willy. It is freezing here, quite literally. Our thermometer has been hovering around twenty-two degrees since the sun came up, and I’ve got nearly enough layers to rival little Randy in A Christmas Story, yet my feet remain cold. Blasted poor circulation! All is not lost, however. I am in good spirits and thinking fondly of our recent weekend getaway to Eugene and Depoe Bay. We went two weekends ago and had a grand time exploring. Eugene, if you don’t know, is the home of the University of Oregon (for my Colorado friends, think Boulder, circa the early 1990’s). It’s two hours south in the valley, a lovely drive through verdant pastures with volcanic vents like massive mounds of granite scattered by the wind. On the day of our drive, the skies were laden with heavy suitcase clouds, traveling alongside us, and the trees, oh the trees, a patchwork of emerald, gold, crimson, tangerine, and amber: the perfect portrait of Oregon in the fall. Our home away from home was The Excelsior Inn, just west of campus. It has a stellar and quite beautiful restaurant along with lovely, quaint rooms named after classical composers. I chose Schubert, of course, and was very pleased. There are also a myriad of watercolor paintings from local artists lining the halls, so it’s a feast for the eyes too. In another feast for the eyes, we visited the Jordan Schnitzer Museum of Art on the U of O campus. I have to say, it is probably the finest small museum I have ever seen, with an exquisite and well curated collection of art. The building is pretty lovely, too, and precisely what I conjure when I think of an art museum: fine ironwork, high ceilings, gorgeous marble, and shining floors. There’s also a nice cafe and a kids (of all ages) area with costumes and neat activities pertaining to current exhibits. For $5, it is well worth the price of admission. We also had the pleasure of spending the evening with my former student, Matt, and his sweet and adorable girlfriend, Kelly (no pictures – darn!). We enjoyed their good company over dinner and drinks (still a bit odd to enjoy libations with someone I knew as a teenager! ), along with a special screening of the Oregon gem One Flew Over the Cuckoo’s Nest. It had been a long time since either the hubster or I had seen it, and it didn’t disappoint. The next leg of our adventure didn’t disappoint either. Though there was a thick blanket of fog and grave concerns on both our parts that we might not actually be able to see the ocean. I grumbled and fretted, bemoaning our predicament, but was ultimately redeemed when I not only saw the whitecaps crashing but could smell their delightful scent. There is nothing like sea air to buoy spirits! As a perfect tie in to our Eugene adventure, our picture perfect Depoe Bay lodgings (The Channel House) were just adjacent to the bridge in the scene where Jack Nicholson’s character takes the gang fishing. Though we didn’t fish, we ate plenty of local seafood (Yaquina Bay Oysters and smoked salmon, among others, oh my!) and saltwater taffy so fresh it was warm in our hands. We also watched Oystercatchers, and a tenacious Cormorant catch its breakfast (very exciting!) while sipping hot tea and gorging on golden pastries, granola, and eggs. I think it’s what could be described as the height of splendor. Indeed. Sometimes it is nice to get away. Well my pretties, we are knee deep in soup season. We’ve had all sorts around here lately: butternut squash, tortilla, white bean, chicken noodle, and this one here, German Potato. There’s a lot of ingredients down there, but it is super easy and delicious. It is unlike any soup I’ve had before, sweet and sour, with just a little kick. It begs to be eaten with pumpernickel rye slathered in butter and a glass of lager and maybe an Oompah Band playing on the hi-fi. Adapted from Ray L. Overton’s Winter Soups, a book I highly recommend, if you can find it. I bought mine way back in 1998! In a large soup pot or dutch oven, saute the onion, celery, and garlic in the olive oil. Cook until the onions are soft. Add the remaining ingredients, except the chives or green onion, and simmer for twenty minutes. For the bratwurst – you can either add it whole and slice it after it’s cooked (don’t burn yourself! ), or slice it beforehand, your choice. Garnish the soup with the chives or green onion and serve. If you’d like to gild the lily, fry up some bacon and sprinkle over the top.